Use this option if you need to create a new domain for your site (you haven’t already registered a domain at another site such as Network Solutions or GoDaddy). Domains are managed from the "Config Domains" screen. from the option to the right. click the "Configure Site" button. 2. 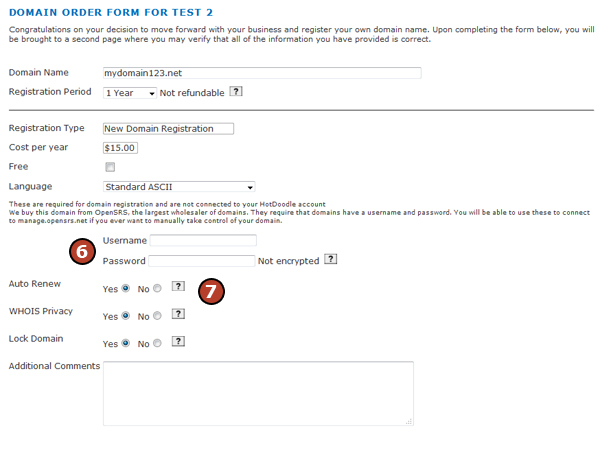 Type a domain to register in the text field under Option 2. 3. Click to add a check mark next to each box applicable .com, .net, etc. 4. Click on the "Search" button. 5. On the next screen, review the possible choices and click the “Register” link next the domain to register. 6. On the next screen, enter a username and password, it will be used to login to the domain host to make changes to the domain in the future. 7. Click the radio button next to "yes" or "no" if you want your domain to auto renew each year. The renewal cost is $15 per domain, per year. The auto renewal feature is recommended to avoid any interuption at renewal time. 8. Fill out all the required infomation. Warning: Invalid Email Address will Suspend the Domain! 9. Click on the "Save and Validate" button. When registering a second domain, there will be a pull down to reuse the registration information entered on this screen earlier. Once registered, this domain is automatically connected to the HotDoodle website. This will contain a link asking you to validate your email address. You must click the link in this email or your domain will be suspended. 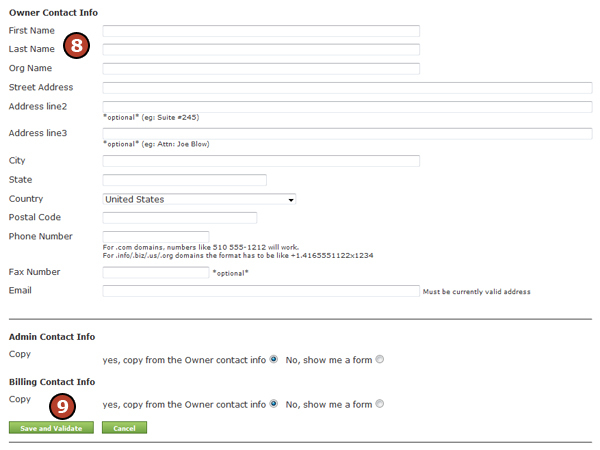 Read about domain contact validation. Do Not Let Somebody Steal Your Domain Name Idea! Take care when searching for a domain name. Some companies take the name you search for and register it themselves, or else by some unexplained "coincidence", some allegedly unrelated place offshore just happens to register the name you are searching for and they do this very shortly after you do the search. They will offer, however, to sell the name to you for more than it costs to register. This is a scam practice. Free “whois” lookup services are common scammers of this sort. Even some well known names such as Network Solutions have been accused of running similar operations where names you search for are taken. This is enabled by a flaw in the domain registration system which allows a domain to be registered for 5 days and returned for free. So it costs the scammers nothing to register your name, hang on to if for 5 days, and then release it and microseconds later have another company they control register the name. See domain kiting, stealing of domain searches, and domain front running. Do not search for a domain name until you are ready to buy. Waiting overnight gives scammers time to register it instead. Do not search for a domain with a questionable company. Do not search for a domain with a large company that takes the name under the guise of "protecting" you. Do search via HotDoodle -- start the domain registration process and simply do not register after seeing if the name is available.